There are 11 posts in this thread, and it has been viewed 10149 times. Bang Bang Busters. What do you think of it? What we've got here? A long-forgotten Neo Geo prototype title out of nowhere, an enrichment for the whole community! OK, in fact Neo Conception International (which is suspected to be conducted by the same man behind Tokyo Toy Factory) already released the game last year on MVS and AES, a NGCD version of Bang Bang Busters is said to be released in the next time as well. But it's still great to see long-lost Neo Geo titles suddenly emerging from the swamps of the past and that they finally can be enjoyed by us ordinary mortals. Recently the game has been dumped and can be played on some emulators as well. But I nevertheless would like to point out that the game still can be purchased as NGCD version, and, if we accord credibility to NCI, the game is fully licensed by Vicso as well. So if you are an NGCD owner and if you would like to support the original developers to some extent, I recommend getting it. And if you are interested in participating at a High Score Challenge for BB Busters, just let me or Priest know. 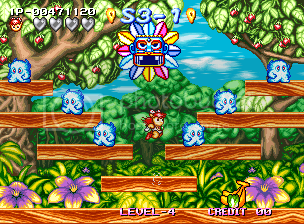 This game is from Visco and it was originally intended to be released back in 1994. 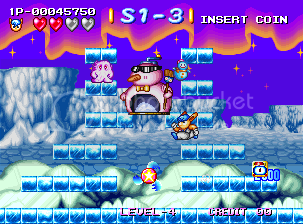 It is an action-platform type game with play mechanics similar to Snow Brothers, Zupapa, Bubble Bobble and similar style games. 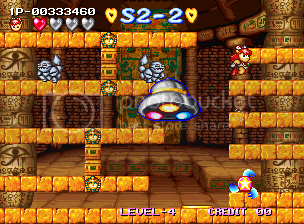 The two characters can actually "blow up" enemies by puffing them as is done in Dig Dug, and even toss them onto other enemies for chain points. 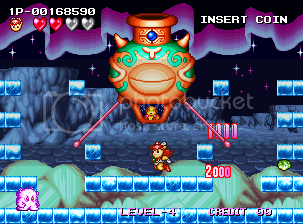 It also contains special bonuses and many stage bosses. It was rumored that the game was undergoing re-consideration for release in 2000. About a year later, Zupapa made it to market instead. 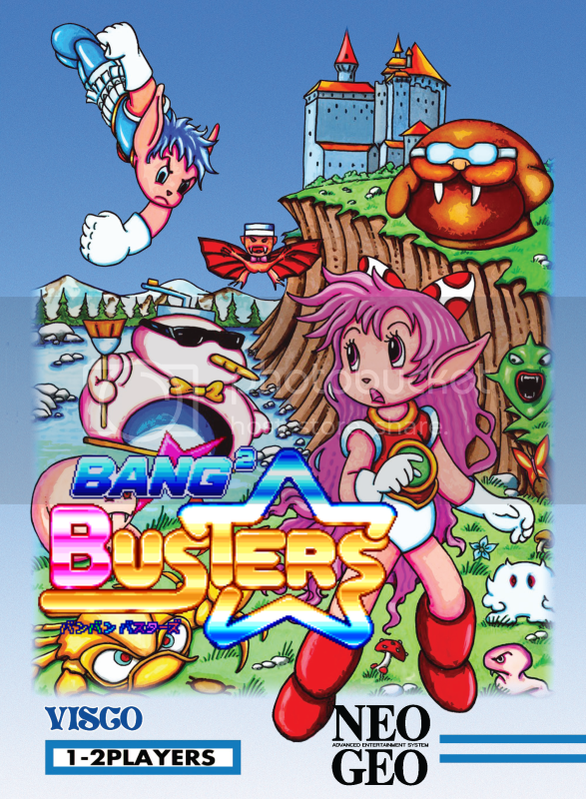 This game also goes by the name "Bang 2 Busters" by some sources. As a point of reference, in the Japanese culture, it is considered to be a tremendous compliment when a proper name is "doubled". Video games are no exception to this. Examples: Joy Joy Kid, Fun Fun Brothers, Pair Pair Wars, Waku Waku Seven and even Doki Doki Panic, cousin of the USA Super Mario Brothers 2! Upon request. Come on guys, let's submit some scores! Never tried it, and probably never will. The style and presenation are not my taste at all. The whole thing looks terrible, IMO. I'd much rather stick to NiTD or Zupapa! Only way I'd give it a whirl is through emulation. The cart is way too high priced for this sort of--- well... as you English fellas say... 'rubbish". Looks like a typical Snow Bros clone of which the NG already has 2 but I will pick this up at some point as it would be nice to buy a new NGCD game. Full credit to the small studio for actually making the effort to get the game out. Unless a game is absolutely appalling I think an effort to get any prototype out for people to play is a cool and generous idea. Actually buying the game could be a bit tricky as the website appears to be frozen. Unless a game is absolutely appalling I think an effort to get any prototype out for people to play is a cool and generous idea. If you are referring to 'Treasure of the Caribbean', I'm with you. The official NCI website is pretty garbage in my eyes. I suppose that Laurent guy doesn't know anything about Marketing or how to present his 'company' decently. The first announcements of Bang Bang Busters at Facebook were horrible too in my humble opinion. But as long as he continues digging out more prototypes (Warlock of the Fates?) and sharing them with us, it's all right I suppose. I pre-ordered the game at Neo Ayato STE. That's where I also bought TOTC. It's nice that more people can get a chance to play BBB using Mame now but I agree with Murikov that since the NCI release is officially licensed by Visco hopefully people will consider buying a copy if they have an NGCD. graphics. I'm a big fan of NITD and Zupapa so this looks like something I would enjoy. People who have played the game tend to be mostly positive about it. I've never come across a bad game by Visco before. A little repetitive and boring after 30 min. Hmm... Not really the style of game I'm fond of playing on the Neo but looks pretty decent for its genre. Probably wont be plunking down the bills for an AES copy but it's always really great to see a once-buried title rise from the grave to achieve a retail release! Can any Neo CD owners of this game chime in on what they thought of this release? I bought B2B NGCD recently and I really like it. The game has an appealing style of graphics and the gameplay while not groundbreaking is fun. It's satisfying spinning enemies around and throwing them into each other to cause a chain reaction. The bosses are quite cool designs too. B2B doesn't seem quite as good as Nightmare in the Dark or Zupapa but is still a very good game well worth getting. The NGCD version only has loading time right at the start. The manual and spine card are good quality. Thanks for the information . I may go ahead and try to pick up a copy of this. It looks like it might be the most complete prototype we may see for a long time on the Neo CD.